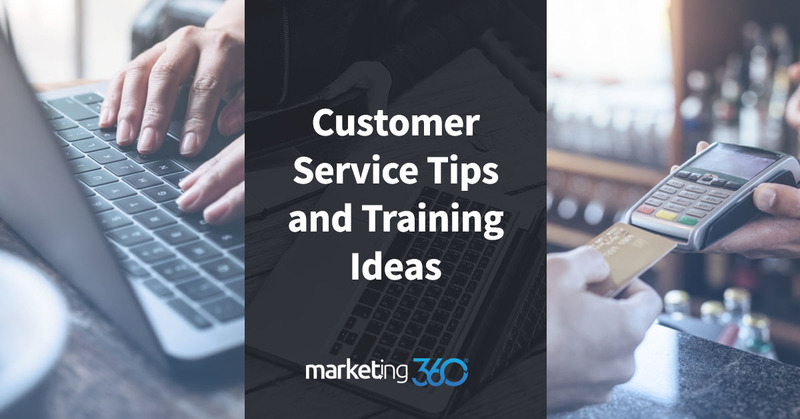 At Marketing 360®, we take customer service seriously and train our staff extensively to provide the best customer experience in the SMB marketing industry. Here’s founder JB Kellogg with some of his best customer service training tips. You can’t overstate the importance of customer service in the digital economy. Reputation makes – and breaks – businesses today. Every customer is a potential critic that can publish a review of their experience online. Competition is unrelenting because choices are virtually unending. You don’t just need to deliver excellent results for customers. You need to make them feel good about working with you. An overriding principle to customer service success is having a customer-centric approach that permeates everything your business is about. But there are also many practical, daily behaviors you need to train your staff on that have a major impact on customer service. Here JB reviews some that work well for Marketing 360® and our clients. We often talk about customer service in terms of sweeping reforms and complete company-wide policies. But one of the most powerful things you can do to improve customer service is to fix mistakes as soon as you recognize them. It’s easy to sweep little things under the rug. Little problems that are likely to go unnoticed anyway. But it’s these little things that add up and deteriorate a company’s customer service overall. Make it part of your culture to solve issues instead of ignoring them or procrastinating. The cumulative effect is powerful. Patience is a virtue in many aspects of customer service and sales. It starts, quite simply, with being a good listener. One of the single most important skills in sales is listening to leads. They’ll describe the problem they want you to solve. When you listen, you can frame your pitch around the lead’s active need. Some problems are repetitive. It can be difficult to listen to people when you already know what to do. Likewise, some people have trouble getting to the point. Customer service pros let them talk it out, almost like a therapist. In the customer/business contract, the customer expects the business to listen to them and patiently resolve any issues. It’s part of what you’re being paid to do. If any member of your staff is notoriously impatient, don’t put them in a customer facing role. The point JB makes here is important. If customer service is a problem at your business, you don’t have to change everything about your approach. Just a shift in attitude can have a powerful, immediate impact. Customer service really is a top-down aspect of running a business. The leadership must see being customer-centric as part of their mission. They must lead by example, and train staff on the importance of customer service. We rarely see a business that has a customer service problem that persists because one employee on the front lines isn’t performing. In businesses with customer service focused leadership, such a person would be removed from their role. However, if people in leadership positions are faltering at customer-service because of an inconsistent attitude, it’s a crippling problem. Attitude is everything, and it starts at the top. “That’s not my job” are not words that get uttered in businesses with a strong customer service ethic. One of the most powerful things you can ingrain into your staff is that they’ll solve any customer’s problem efficiently instead of just ignoring or bucking the problem. Now, this doesn’t mean you want the nurse doing surgery. Not all roles at every business are interchangeable. But it does mean working as a team to resolve customer issues without delay. Mainly, customers want to know someone is on it and that they care. If the person they’re dealing with can’t solve the issue, they’re seeking the one who can solve it. When we talk about someone “dropping the ball”, what that usually means is that there was a customer service issue that needed another team member but that person was never brought into the loop. Whatever your role, when a customer needs help, your role is to get on top of the problem. If you can’t do it yourself, find the person who can. When it comes to customer service, the process always involves listening. Even when you’ve heard the problem before. Even when you already know the answer to their question. Make sure you don’t cut people off when they’re describing their problem. People want to be heard, and they’re reassured when they’ve been allowed to voice their concerns fully. Also, remember that it may be that you haven’t heard it before. A new issue may arise connected to a particular client. The solution may not be obvious. Only when you listen and follow the process step-by-step can you be sure you’re moving towards a full resolution. It’s impossible to overstate the importance of a positive attitude when it comes to customer service. It’s the heart of the matter. A positive – or negative – attitude permeates everything else you do with customers. A positive attitude can smooth over a serious matter that you’re otherwise struggling to resolve. A negative one can turn a minor problem into a customer service nightmare. This isn’t just how you deal with customers, as JB points out. In fact, that’s usually not the issue. Most people who work in customer-facing positions can at least feign positivity – even on the worst of days – when dealing directly with customers. But when staff starts barking at each other behind the scenes, it casts a cloud over everything else you’re trying to do. Positivity is a vibe everyone picks up on. Again, this starts with the leadership at your company. When they’re positive, it spreads to everyone and customers feel it. When they’re negative, same thing. Today, being a customer-centric business that builds a customer-service ethic into the core of how you execute work is a key to success. People will remember how you made them feel. Just look at the reviews of any business, both good and poor. The reason most of those customers wrote reviews is because the business either made them feel special – or ignored. Customer experience is part of your marketing strategy. In many ways, it’s as important as the product you offer. It has a huge impact on your online reputation, which is critical to modern lead-generation. If your customer service isn’t having a positive impact on your business, get after it. Follow these tips, and create a set of your own. When people feel good about working with you, you’re doing everyone involved with your business a service.